Capital Geek Girls: Headquarters Announcement! WE HAVE A SECRET LAIR. It's been an exciting couple of weeks for me, as the lead on the Capital Geek Girls fanclub. (If you don't know what I'm talking about, check out the post announcing the formation of the club.) Tons of great geeky girls (and guys) have joined the Facebook fanpage, and I'm receiving tons of leads on great events happening around the city that are geek girl-friendly. There's a lot of support for the geeky girl movement, and it's time to take it to the next level. It's time for a headquarters. An Xavier's School for Gifted Youngsters. 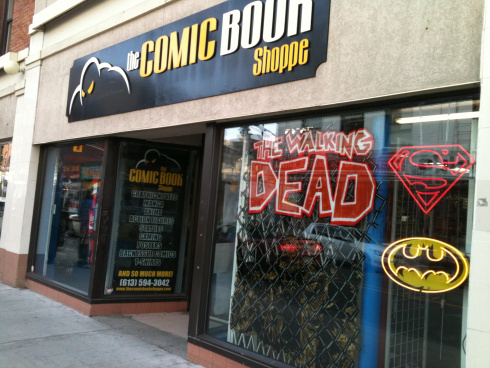 Negotiations wrapped up this week (negotiations = sandwiches and the rolling of some 20-sided dice) with the Comic Book Shoppe on Bank Street. The Shoppe has been a forerunner in girl-friendliness for a long time...I know this, as a patron now for about a decade...and since it was their special Ladies' Night event that got me excited about this whole 'sexism in Geektopia' thing anyway, it seems like a natural fit for the club. With the Shoppe on Bank Street as our headquarters, Capital Geek Girls will be able to start hosting events and providing a geographical beacon for geek girldom in the city. There are talks of hosting another Ladies' Night this spring, and even ramping up the girl-friendly gaming nights that already occur at the Shoppe. Whenever an event is held in a particularly geek girl-friendly fashion down there, we'll be spreading the news and making it known. This super-cool headquarters will provide us with a base of operations from which to take over the world. There are a lot of conventions and events coming up in the Ottawa (and Montreal and Toronto) area; with a headquarters, we can spread our geek girl power far and wide. 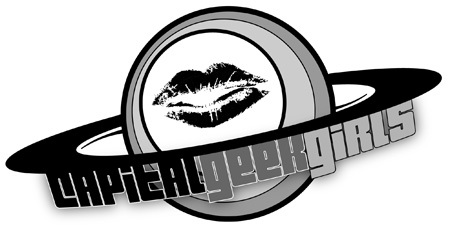 If you have any ideas of things you'd like to see Capital Geek Girls hosting, comment below or email me. And keep following the Facebook fanpage, where we keep you up to date on fangirl news and happenings! I’ve been painting for years, and I absolutely love it. I used to do a lot of commissions and art shows, but recent years has seen me focused more on craft and writing. 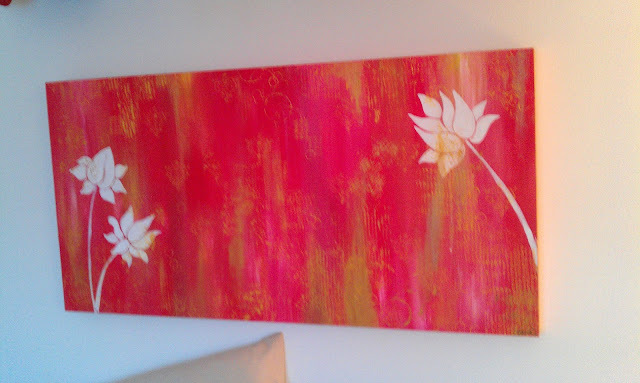 But with my bedroom makeover slowly coming along, I realized I needed a big painting to start tying the space together. I hate buying art at a department-type store because I’d always rather do something myself; but I know that both these options can seem intimidating to people who don’t fancy themselves as artists. 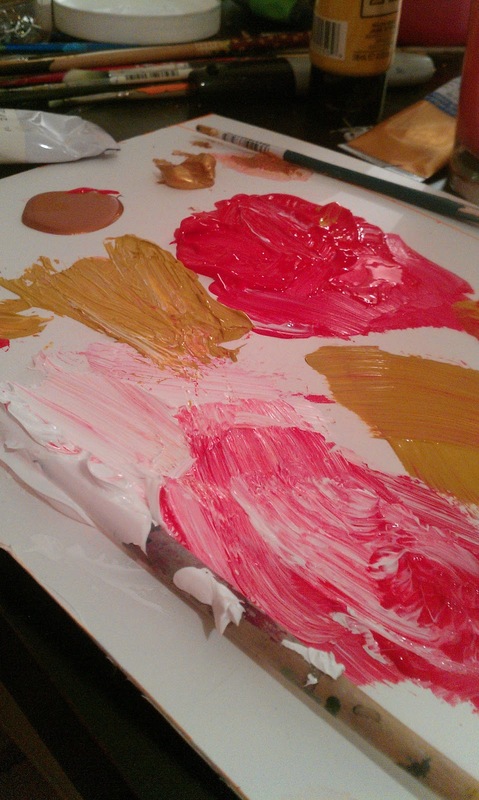 Well, perhaps this tutorial will make the process of creating a painting a bit less daunting. A good painting is always at least 50% about planning. Painting is (generally speaking) about layering, and layering needs to be done in a logical order or you end up with a mess. Think about getting dressed in the morning: if you put your jeans on first, then your underwear, you’d probably deem that an outfit fail. The same concept applies to paintings. -Acrylic paint—any type is fine. I used a mix here of the little craft bottles, and some student-quality thicker acrylics that come in metallic ‘toothpaste tubes’. -Textured things that are okay to ruin—I used a piece of cardboard box, a sheet of weird pressed hay meant for scrapbooking, and a couple of round caps off of some old cosmetics. -A canvas or wood canvas—I painted this one onto a wooden canvas, which I’d primed a while ago. A stretched canvas, sold at your local art store, is also a great option. If you want to leave it unframed, go with the ‘gallery style’, which has a deeper built-in frame and looks better. -Paintbrushes—some big, some small. I like soft bristles for a smoother look but it depends on what you’re painting. A rough, rustic look may work for you. Be sure to have lots of fresh water to clean your brushes and keep them wet if you haven’t cleaned them. The background will likely show through in a lot of spots, even if you paint a whole bunch of stuff on it. It will certainly set the tone in terms of colour and texture. 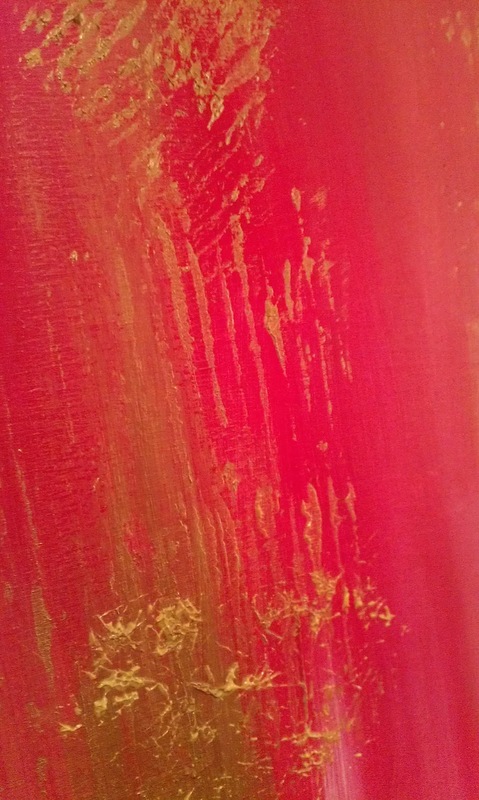 For this painting, I worked in long, vertical streaks of red, warm yellow, and gold. 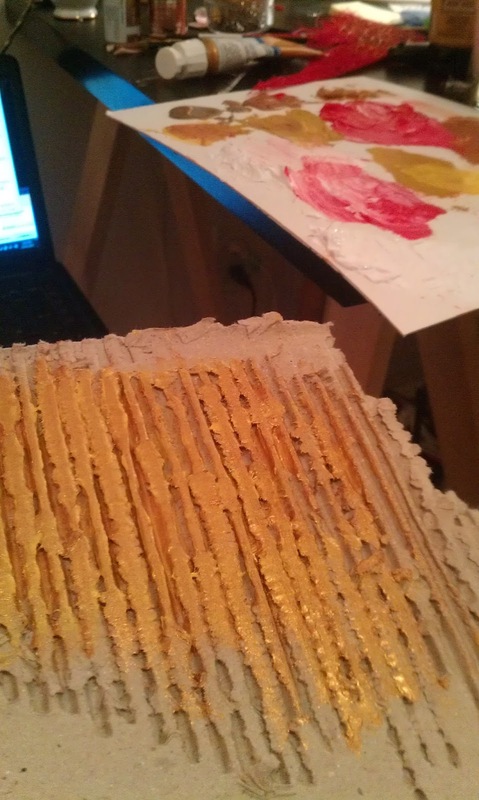 I went a bit crazy purchasing little tubes of gold paint in different tones, and it was worth it because the look is very neat. Remember your colourwheel. If you want a painting to give off a harmonious vibe, keep your colour choices within the same ¼ of the wheel. If you want to add some energy or purposeful dischord, you can choose colours from other sectors of the wheel to add in. Read about complementary colours for more help here. 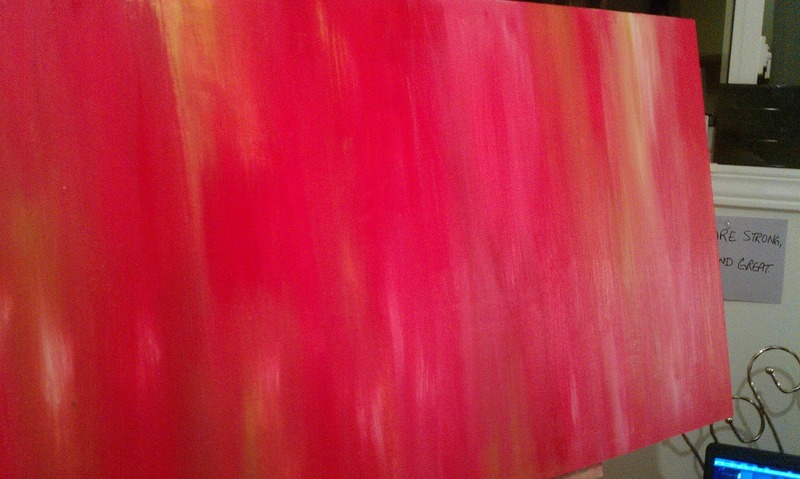 For this painting, I stuck with red and yellow, and added some white to make things a bit pinky. So it’s a harmonious set of colours. Make a lot of streaks. 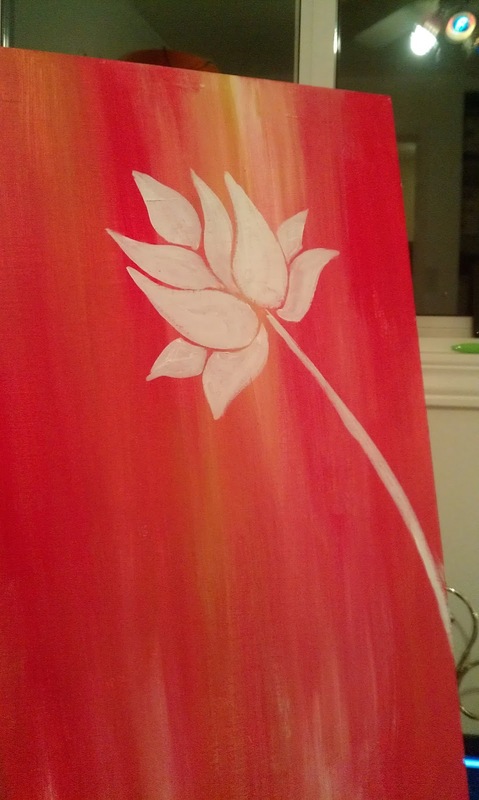 I looked up some lotus images and freehanded these onto the canvas…because I have a lot of practice. 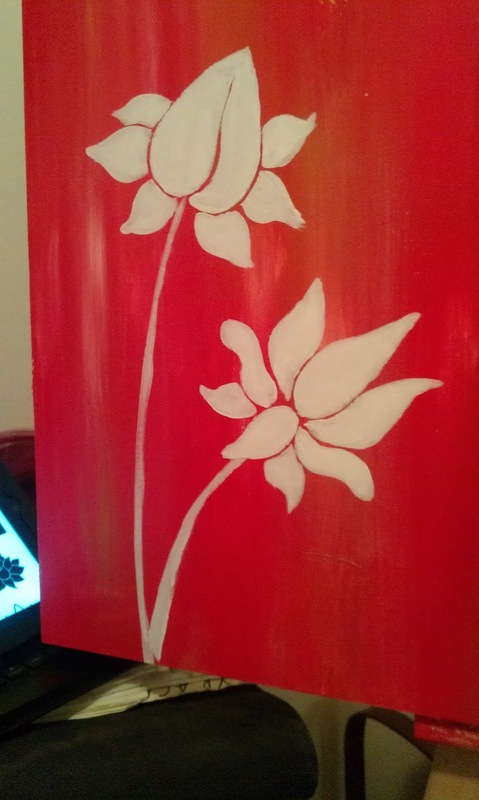 I don’t recommend you freehand something like a flower onto your painting if you don’t have practice under your belt. Once your background is dry (anywhere from 20-60 minutes), you can use a piece of chalk or even a light-coloured pencil crayon to draw your design onto the canvas. Or better yet, use a stencil or a projector. Projectors are a great way to ‘cheat’ in art—and trust me, art is all about cheating. Once you get your chalk or pencil crayon onto the canvas, choose a contrasting colour to paint your design on. If you want to do your flowers (or whatever you drew) in a colour that is lighter than the background, do them in white first, let them dry, and then paint over top of the white. It’ll work like primer. Remember that paint isn’t perfectly opaque, so using white as a primer is often a good idea. For this painting, though, white was the actual colour I wanted. Still, it took three layers of white to really make it opaque. I wanted gold paint textured right over top of the lotuses and everything else, so this is when I started adding texture. A piece of cardboard box, with the first layer pulled off, provided a great ridged stamping tool. squished it onto the painting. The result of the cardboard texture. The weird pressed-hay paper I found in the scrapbooking aisle made a squiggly mess that I quite liked. 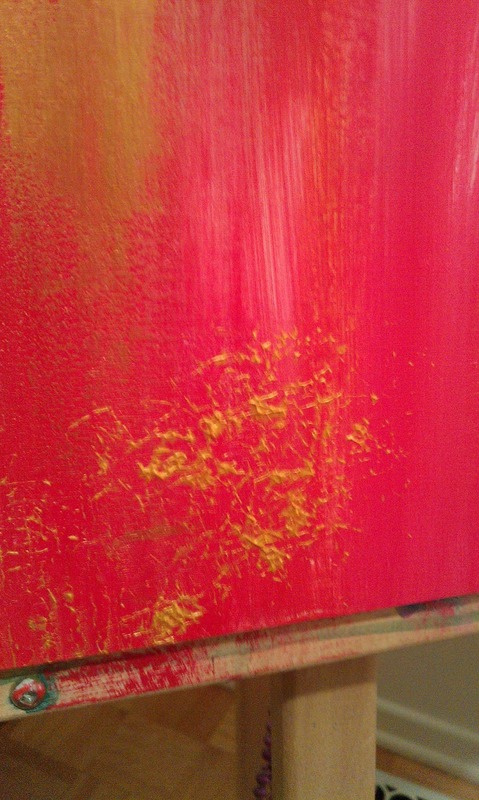 then pressed it into the painting. 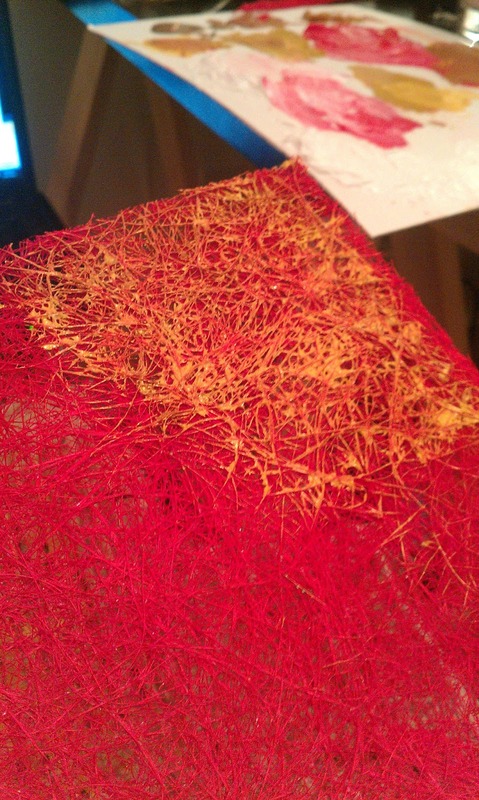 The end result of the straw texture. And I even grabbed a couple of actual stamps I own for cardmaking, and dipped those into my thickest paint and got some pretty good impressions on the canvas with those. 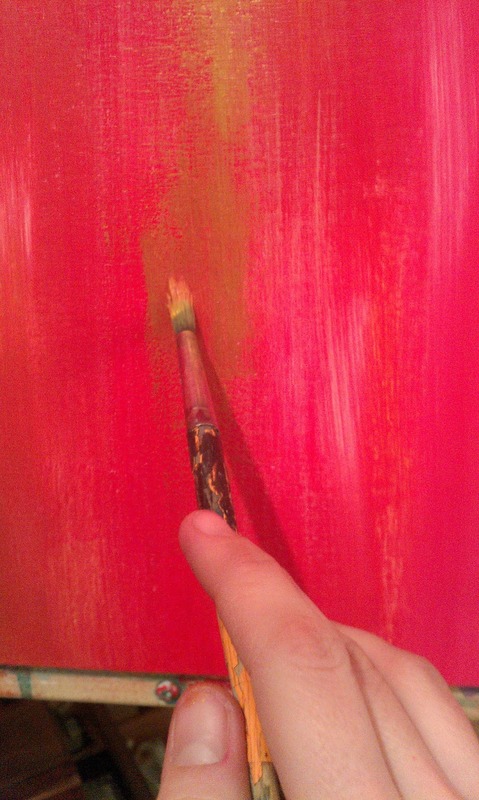 Painting the sides of the canvas (the edge of the frame, basically) makes it look much better if you hang it unframed. I painted the sides gold on mine. You can also just continue the background colours right over the sides, though. If you want to be sure your piece is protected, wait three days and then use a water-based varathane/polyurethane to seal the piece. It’s not mandatory with acrylic paints, but you may like the look of it. Don’t worry about it. Let the mistake dry, then paint over top of it. Be creative and don’t fear mistakes! That fear will only hold you back. If you mess up really badly, you can let it dry, sand it down a bit, and prime the whole thing over again. Heck, I don’t even usually bother with sanding it. DO STUFF: Roller Skating with Ottawa Quad Session! OTTAWA QUAD SESSIONS: ROLLER SKATES ARE BACK! What has eight wheels, knee socks, and super-sore quads? Me, once a week, when I skate at the Ottawa Quad Session skate night. Watch the interview with Ottawa Quad Session! Ottawa Quad Session is a new all-welcome roller skate night, put together by Carleton U professor Pascal Gin. Pascal fell in love with roller skating as a kid in the 80s, but rediscovered his love of old-school quad skates when he recently attended a roller disco party. Determined to find indoor space to enjoy this great hobby/sport, he started booking time at Norm Fenn gym right on Carleton U campus, and invited people to skate for a low cover charge. He started the skate nights in November, and has already gone from four attendees to twenty-five. The appeal of roller skates is hard to explain. They’re slower and less maneuverable than the modern inline skates, and they’re nothing like ice skates at all; but there’s something wonderful about the way they roll, the way you can play on them, and the way people grin like idiots when they try them out. As a retired derby girl, I already had the roller ‘bug’, but I’ve been waiting for a non-derby place to use my skates through the winter months—and even the rainy summer days. I was thrilled when I heard about Pascal’s quad sessions and couldn’t wait to check ‘em out. The venue isn’t what you’ll remember, if you happen to be familiar with the traditional roller discos; they’re aren’t any disco lights (yet) and the music isn’t blasting. But in some ways, this is great for newbies who may be nervous of trying quads, and it’s good too for the derby girls who do show up and run some casual drills. There’s a great mix of first-timers and old-timers, and the vibe is very welcoming. I’ll let the video speak for itself. You’ll see lots of guys and girls skating around in the background, just enjoying the track or trying out some fancy footwork. Over time, I suspect we’ll see more skate dancing and trick-skaters coming out of the woodwork, especially with a roller skate shop right here in town, finally. And I mean what I say: if you come out for a skate night and I’m there (which I try to be most nights), say hello! If you’re new, I’ll make sure you know a couple good stops and anything else you may wanna learn. I used to coach, and I love helping skaters get started. If you’re not-so-new, I’m always happy to talk skating just for fun. Stay in touch with the Ottawa Quad Sessions on their Facebook fanpage, and be sure to click ‘get notifications’ so you don’t miss any announcements. See you on the roller rink! 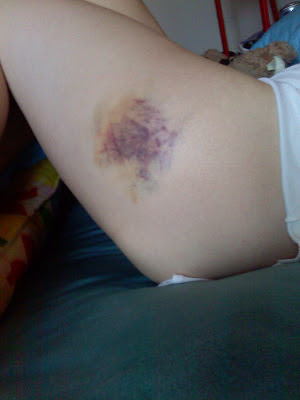 Okay, and because it's pretty great: here's a picture of my hip after one of my more epic roller derby crashes...ah, memories. I don't know if my dad has ever been prouder than when I showed him this. Music means a lot to me. It has gotten me through tough times, and it’s augmented the good times. So often, I find music knows just what to say, when words fail me…and even though I love to write, they fail me a lot. It’s a common rhythm in music, found in many eras. Two close-together claps, a pause, then another clap. You can hear it in many songs. I’ve been slowly compiling a list of songs that have this popular beat. I encourage you to head over to iTunes and download these babies…the songs all tend to have a bouncy, upbeat feel, which is perfect for this miserable cold winter weather. Or, you can listen to the songs each on Youtube first…or, you can head over to my Grooveshark and just play the playlist right through. Here are the songs I’ve got so far; I heartily encourage you to send more my way if you find them. Some of these don’t start off with the clap-clap…clap rhythm right away. Wait for it! Enjoy your virtual mixed tape, friends. Try not to dance in your chair, I dare you. I have a condition called endometriosis, which means I have a very painful cycle. There’s a lot of theories on how endometriosis works, but here’s the real story. Instead of a uterus, I have a badger. I figure what happened is that, when God was making me, it was a Friday afternoon and he was tired and off his game, and instead of grabbing a uterus from the uterus box, he grabbed a badger from the badger box. The badger, which we’ll call Wocky (short for Jabberwocky, which is probably the more accurate description) lies dormant, hibernating, for most of the month. Mid-month, however, he reaches one long, clawed arm up towards one ovary or the other and squeezes with his scratchy talons. That’s always fun. A few days before the end of my cycle, Wocky starts to wake up. And Wocky is ravenous. Wocky wants chocolate…and salt. And chocolate salt. And salt on top of his chocolate salt. And then fat. Wocky has wired puppet strings to my brain that allow him to override my self-control, and I will find myself standing in the kitchen at 2am with a half-eaten box of baker’s chocolate and an empty jar of olive tapenade. At the end of my cycle, Wocky loses his mind and starts clawing at my insides. For 4-7 days, it is literally as if an angry, rabid badger is biting, clawing, and gnawing on my abdomen, my lower back, and all my internal organs. I get dizzy and sick, and nauseated, and weak, and I could sleep for days. Probably because those internal organs are kind of essential and best left unchewed. When you try to talk to me during Wocky’s week, I can barely hear you over the constant snarling and badger ravaging that’s happening in my belly. When you ask me why I haven’t walked to the corner store, it seems impossible to explain how angry Wocky will be with the motion and how he will pull on nerve endings that make even my knees ache. If I'm weepy, it's from experiencing endless days and nights of indescribable pain. When you look at me funny for eating crackers with pickled eggplant and Dijon mustard, you clearly do not understand that I am desperately attempting to assuage a very angry, vengeful woodland monster. And if you’re one of those lucky women who was given a proper uterus at birth, and you’ve never experienced a badger in your belly, I just want you to know that I may love you, but I also hate you.